What a year it has been. A lot happened during 2016, and this blog was no exception. Since this will be the last post of 2016, I thought it would be perfect to reflect back on the year and to share some of my goals for the new year. I made some big changes to this blog last year, and I know that I will also be making some other (somewhat big) changes in 2017, so I want to also update you guys today so that you can have an idea of what’s to come. In January, I changed blog names from It’s Mixed Arts to Killer Harmony, and I bought a domain name to prove it. I also moved back from WordPress.com to Blogger so that I could use the domain without having to pay extra. Another cool thing that happened was that I was published on the Huffington Post. While I did not get paid for the post nor did it get a ton of views, I am happy I did it. I had a post that I wanted to share but it wouldn’t quite fit this blog, so I thought of Huffington Post. I am grateful for the experience, and I can now put it on a resume. In February, I blogged about blogging for the first time. It was a little out of my comfort zone, because I had only ever blogged about college. But, I thought it could be cool for me and my readers (that’s you) to see something a little different. I also liked getting to put a spin on blogging that college students could relate to. Since that first post about blogging, I have managed to include blogging related posts more often and include blogging as part of my niche. These next few months, I didn’t really have much going on. I went to blogging once a week instead of two, which had its pros and cons. Other than that, it was blogging as usual. At the end of June, I finally made the jump to self-hosted WordPress! I had just finished my two online summer classes and thought it would be the perfect time. I could use my extra free time to learn the ins and outs of how WordPress works, figure out plugins and themes, etc. I am so happy I switched, I only wish I didn’t put it off so long. I spent a lot of time learning about WordPress and working on making my blog look like my own. I also had to prepare to move back into a dorm for my last year of college. In July, I celebrated my 21st birthday…no alcohol, though. With school as my main focus, I didn’t really do much out of the ordinary. I continued blogging once a week, and I got a little better at promoting my blog and posts on social media. At the end of November, I finally worked up the courage to reopen my Etsy shop with downloads. I opened on Black Friday with ten listings and have added a few more. I plan to add more listings soon, which I will talk about more in the section on my goals. I decided, literally the day before December, that I was gonna do Blogmas. I didn’t post about it on the blog or social media until December 1. One might think I was a crazy person for posting every day on my blog, and I wouldn’t disagree. I wanted to do Blogmas, because once a week was getting a little boring, and I wanted to challenge myself. This semester, I lucked into only one final, so I didn’t have as much work to do at the end of the semester. I haven’t broken my goals down monthly yet, because I want to do that on a per month basis. That way, I can change my goals each month based on the progress I make. 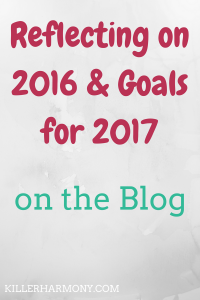 In this post, I am going to share some goals that I want to accomplish in 2017 in general. I graduate in May, and I do not plan on attending graduate school this year. So the only goals related to school are to finish strong and to keep up with my friends from college (and from childhood). I have a feeling that if I don’t keep up with those friendships now, it will be harder later. Also, I want to finish college strong so that I leave with a better sense of accomplishment. Since I will be able to work full time come the middle of May, that definitely made the list. Specifically, I want to make a full time income from home online. I want to work with bloggers and businesses to improve their blogs and social media. I might have to take a job at first, but I would love to eventually work for myself and to take on clients that I choose. This year, I really want to cut out certain junk foods entirely. I have a bad habit of eating a whole bag of chips in two days, so I don’t want to ever have chips, unless they are in a portioned bag. For snacks, I want to stick to fruit and pretzels as well as the occasional popcorn. I also want to move back in with my parents (yeah, I know what you’re thinking). I plan to move back home for awhile so that I can save money while I am just starting my career. At home, I can live rent free in a nice area, and I can save more of the money I do make for when I am ready to move out. Those were some of my memorable moments from 2016 and my goals for 2017. I will keep you guys updated as I achieve these goals, and I hope that this post will help keep me accountable. What are your goals for 2017? Let me know in the comments! Also, be sure to check out my latest post and follow me on Twitter (@HannahHaefele) so you don’t miss future posts! You accomplished so much! My goals are to do better, learn better, and overall be better. Bettering yourself is such an amazing goal! Don’t hesitate to specify how you want to do that or in what part of your life you want to be better! Thank you! I hope you have a great 2017, too!